We’re always looking for ways to save money, especially on things we use/buy regularly. You may remember our foray into making our own breakfast sandwiches. While not very big on cost savings when you factor in the time to make them, it does offer the opportunity to expand into variations other than the 3 flavors offered at Aldi. 3 tablespoons of sugar in just one small container of yogurt. Yikes! Now granted some (not much) of the sugar comes from the milk, but companies tend to make up for lack of fat (flavor) in products by adding sugar. It’s very difficult to find full fat or low sugar yogurts without spending over a dollar per 6oz cup. Not very frugal when you’re on a limited budget. After that realization we coughed up a little extra money for the name-brand regular yogurt at about 50-70 cents a cup. The sugar content was reduced but not by much (24-26 grams or 2 tablespoons). About a year ago we started on the Greek yogurts and bought tubs instead of individual cups when it made sense (coupons make the pre-portioned cups a better deal). The plain Greek yogurt quart tubs cost $3.89 and only have 10-16 grams of sugar. You’re probably thinking why not just get the generic “lite” or “carb master” variety and save yourself the money and have the lower sugar content. That comes to the matter of taste. I can’t stand the aftertaste of artificial sweeteners. Picky, I know. 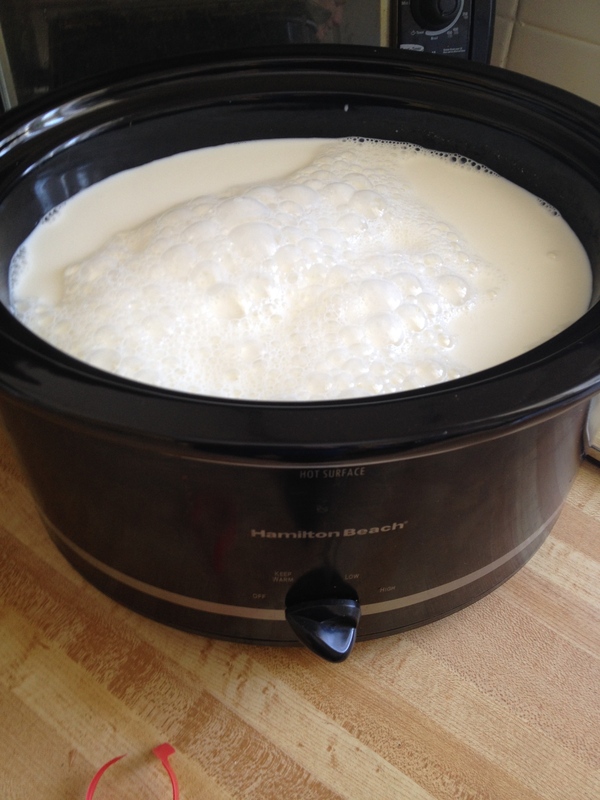 You begin by pouring your gallon of milk into your slow cooker, put the lid on and turn it to the low heat setting. We have a 4 quart slow cooker so we couldn’t quite fit in a whole gallon. You want the milk to heat to 180 degrees to kill off any bad bacteria present so the good bacteria from the starter yogurt can grow freely. This is important so use your thermometer to make sure the milk gets hot enough. Depending on the heat output of your slow cooker it can take several hours (ours took about 3 hours). 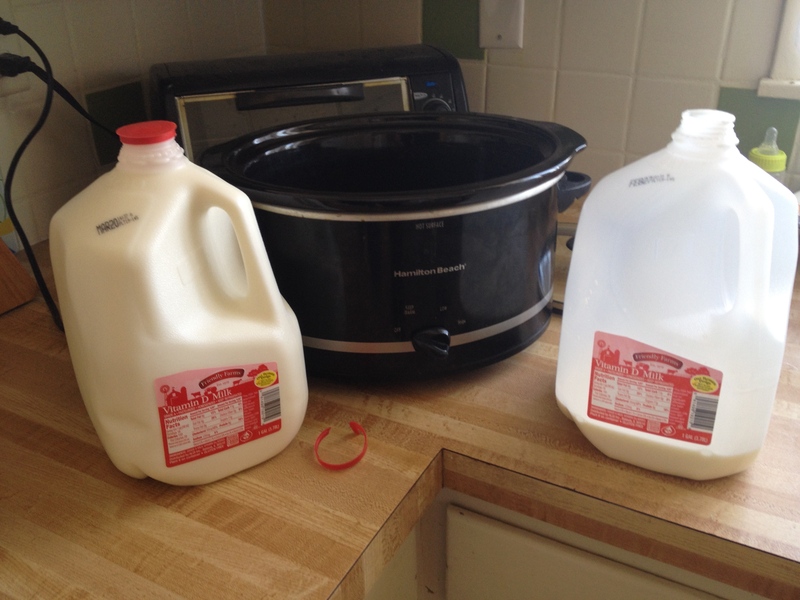 Once the milk hits 180, turn off your slow cooker and let it sit with the lid on to cool to 95-115 degrees (another 2-3 hours). This is the ideal temperature for the good bacteria to grow. 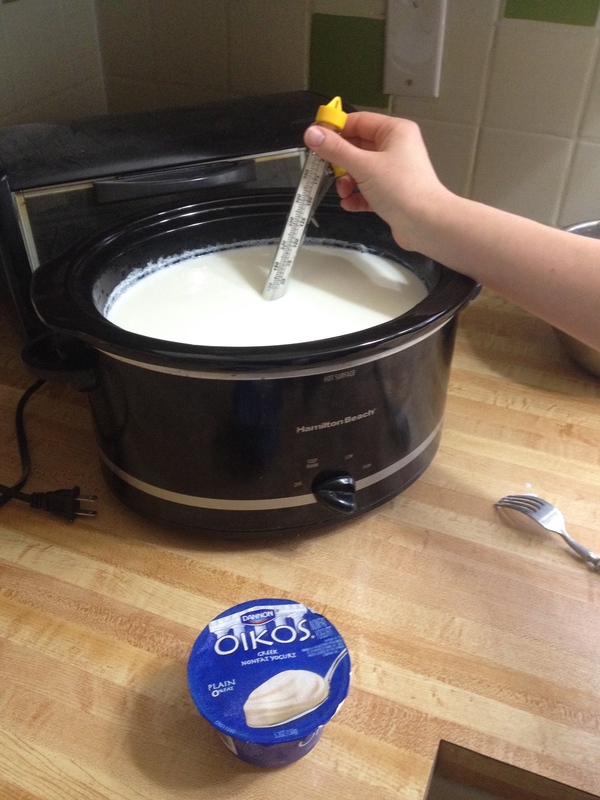 Take about a cup or so of the still warm milk out of the slow cooker and mix it with your starter yogurt. Pour that milk/yogurt mixture back into the rest of the milk and mix well. At this point some recipes had you stick the yogurt in a cool oven with the light turned on. Other recipes had you use a thermos or cooler. The goal is to keep the milk at a stable, warm temperature while it ferments. 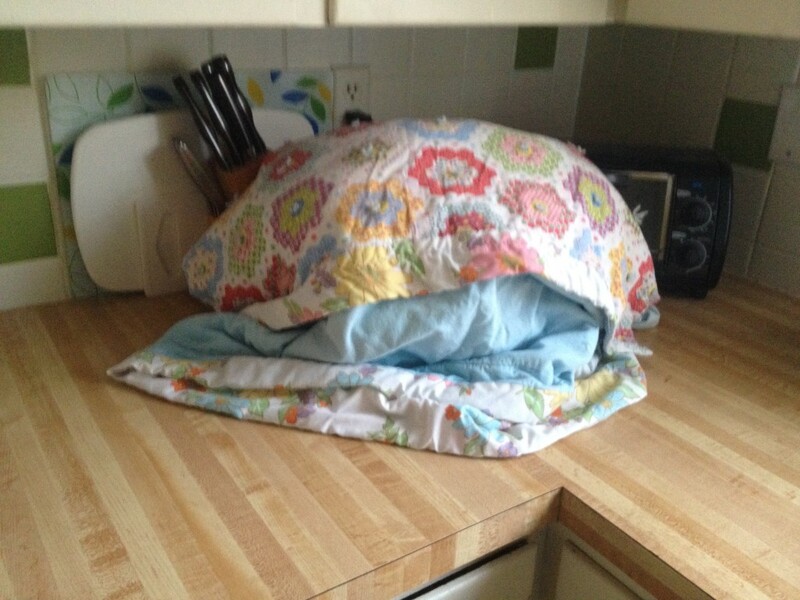 We opted for wrapping the slow cooker in a blanket to insulate. Your job is done at this point and the live bacteria from the starter yogurt go to work. The yogurt should sit for 8-12 hours in its cocoon. If you like more sour tasting yogurt let it sit for the 12 hours, for a less tangy yogurt 8 hours should suffice. We let ours sit overnight for about 12 hours. 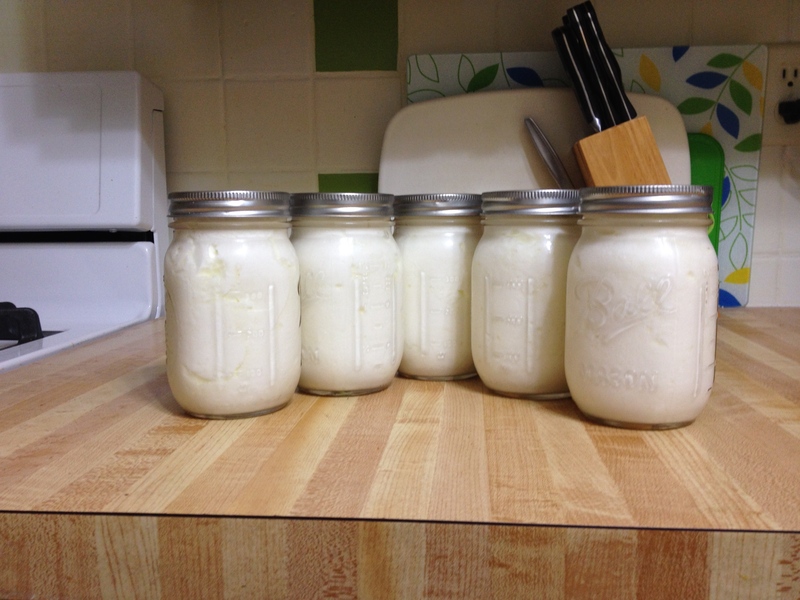 Once the fermenting period is up you can transfer the yogurt to containers and place it in the refrigerator. We had about 3 1/2 quarts total of yogurt. About a quart was eaten by the time I remembered to take this picture. Your homemade yogurt will keep for about 2 weeks (if you don’t eat it all before then). Our total cost was $3.69. $2.69 for the milk and another dollar for the starter yogurt. The next batch will cost even less as we’ll use a cup of yogurt from this batch as the starter. The taste is great, even after 12 hours it wasn’t very sour at all and the whole milk made it very creamy. 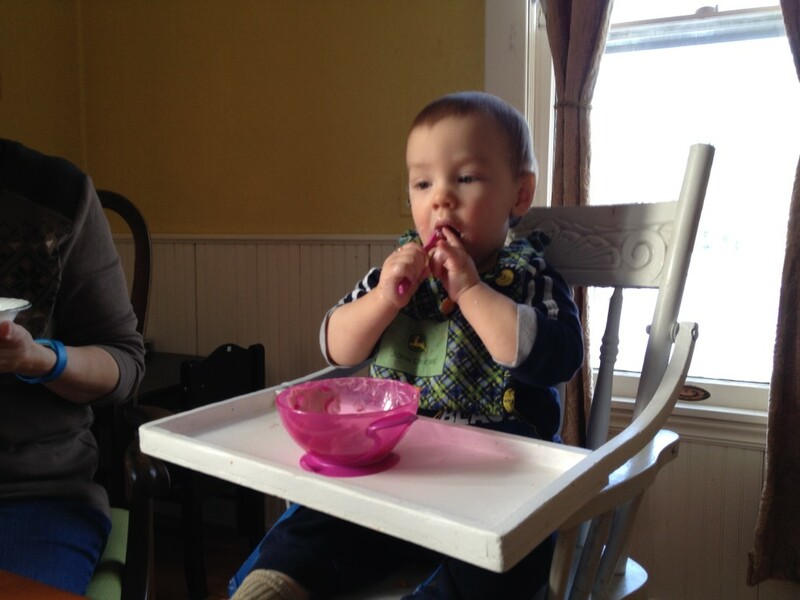 Even Frugal Boy has been enjoying the yogurt. Still hasn’t gotten the hang of a spoon.